Hi, I NEED Help with this, the pipe is simply too high! Is there a way to move it down? The select eliment and move eliment don't work? 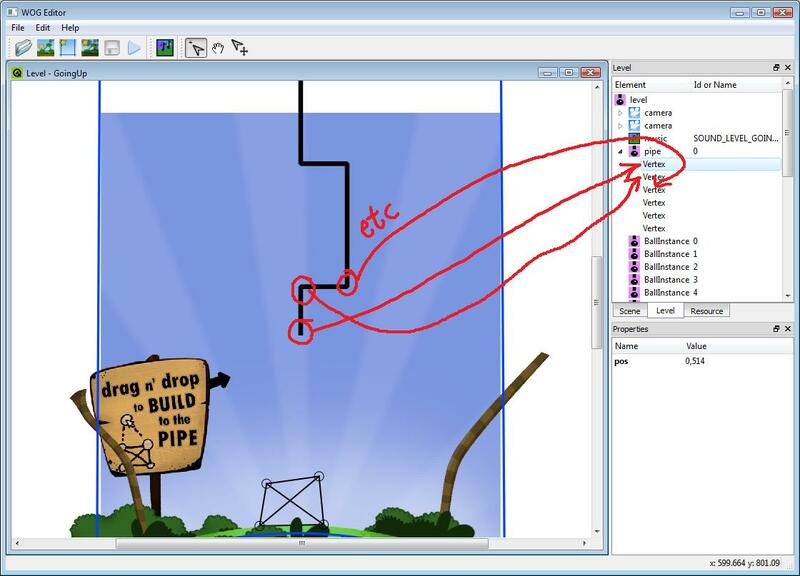 Modify the <pipe><vertex></pipe> elements to move the appearance of the pipe, and modify the <levelexit> to move the actual exit point. I don't believe you can drag and drop them, but you can edit the element properties window. Sure! I think the easiest way to visualise it is to open the level GoingUp, the first level in the game. #1 shows the pipe and its vertex children. This defines the actual physical appearance of the pipe in the level (one vertex per corner, plus one at each end). You can see a black line in the editor representing the pipe. You have to manually double-click on the "pos" and edit it to change each corner of the pipe. There's no way to drag-and-drop, you have to manually enter x,y values. #2 shows the levelexit. This is the actual x,y coordinate in the level where balls will be sucked. Normally you'll want to make it the same as the start of your pipe! Again you double-click on "pos" and edit it to be where you want. Unfortunately wogedit won't show you visually where it is, but if you make it the same as the start of your pipe, you'll be fine.